Ultra Compact Mini PC MiNEW A10 Starts Rocking ! This is an ultra buffalo-usb-portable-hard-disk-drive-compact-and-stylish/">compact Mini PC, comes from Moneual. 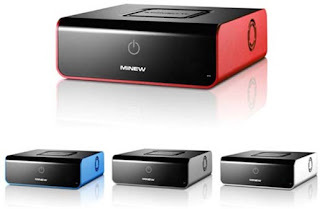 This Korean made device is called MiNEW A10. Normally this device is powered by an intel-refurbishes-its-logo-for-its-processor/">Intel Atom processor. The size of this device is justexternal-hdd-now-turns-colorful-from-i-o-data/"> 20 x 21.5 x 7cm. Moreover, this smallest-pc-in-the-world/">device offers a touch power button on the front panel. The price of this device is just 400,000(KRW). Do you think it is built-in-pc-in-a-keyboard/">affordable for you?